This sword belongs toSaijyo saku (the top) ranking. The blade was polished by highest ranking polisher. Blade length : 76.3 cm or 30.04 inches. Width at the hamachi : 3.45cm or 1.36 inches. Width at the Kissaki : 2.6 cm or 1.024 inches. Kasane : 0.95cm or 0.374 inches. 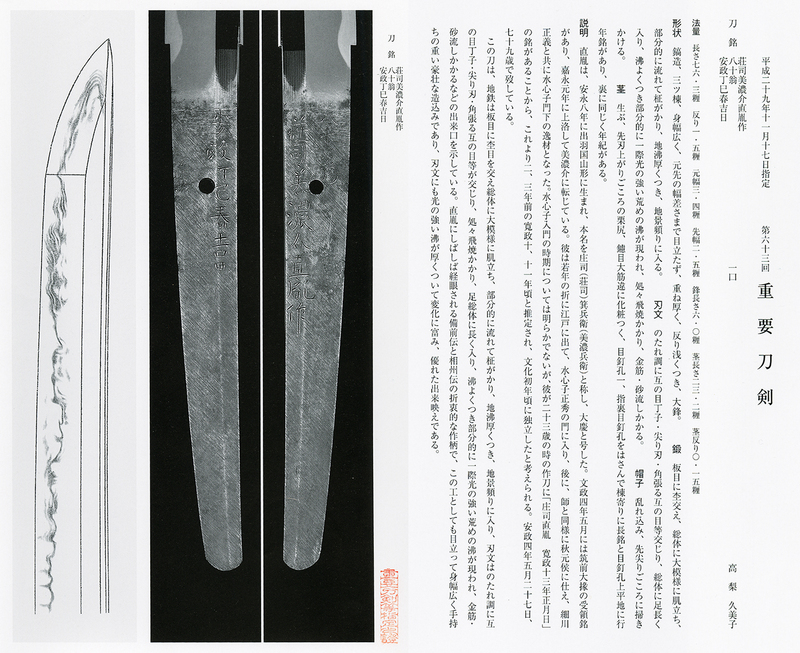 Shape : The blade is very long, wide and thick with nice sori and long kissaki gorgeous blade. The weight of the blade: 1085 grams. Jigane :From the hamachi to kissaki area, item had and uzumakihada mixed well grained and chikei work. Hamon :Niedeki gunome midair and togari gunome, cyojimidare mixed with ash sunagashi also kinsuji scatter. From The hamachi area to Kissaaki , very active double hamon and gunome midair especially sunagasi and Kinsuji scatter. Boshi moot side is round shape many round shape. on the urea side, gunome midare and hakikake style. From the Monouchi to Kissaki. the blade looks typical Kiyomaro style. Yamato-den. He was especially good at Bizen-den and the Soshu-den. His swords are ranked at the highest rank called Saijo-saku in the last days of the Tokugawa shogunate. 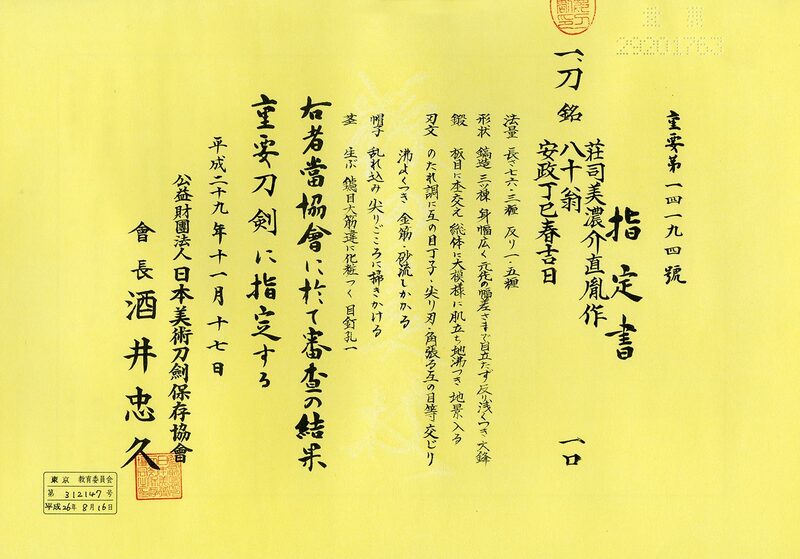 Especially his swords forged in the Tempo era (1830 to 1844) called Tempo-uchi are highly appreciated as his best examples attained maturit This sword was made the final stage Ansei era. From Aoi Art:He studied from Suishinshi Masahide and later on Masahide controvert an opinion of modern swords which is good looking wavy doranba hamon . He said Doranba hamon is easy to break so craftsmen must return to make old style Kogunome or kocyouji midair hamon, The student Naotane followed his master's opinion. But this kind of Hamon are not welched from sword demanded oerson. He tried to make mixed up old style and also modern style. This sword from the Hamachi to Monouchi area, gentle gmall gunome, and cyoji midair and also togari gunome midair hamon, from the monouchi area to Kissaki area, very active gunome with many sunagashi and kinsuji and also kissaki is gunome midair with active sunagasi, asi and Kinsuji like typical Kiyomaro style. So Naotane succeeded to mixed up old koto style and modern active strong hamon. The Hamon is bright and clear wonderful hamon and also well grained uzumaki jigane. I think the blade will be good investment sword. He passed away Ansei 4th (1857) age 79. but on the sword nakago, he engraved 80 Akina(old man) which is not matched his age and the 80.
the age as 80 very lucky life. At Edo period it is almost impossible to enjoy long life so we understand his feeling well. Recently Naotane became NBTHK Tokubetsu Jyuyo token. I think this sword looks as same as that Naotane. so it is possible to upgrade to Tokubetsu Hozon in the future. We strongly recommend this wonderful sword for you. AOI Bijyutsu Syoshin(genuine) Kanteisyo: NBTHK Jyuyo Token.hozon paper.